Location: : From the intersection of Co. Hwy B and Co. Hwy W, continue west on Co. Hwy W about ¼ mile to right turn to Pipke Park. Parking is available at the American Legion Post 480 or continue left around the pond to the Park Pavilion and additional parking. The Pipke Park Trail Systems offers two different trails – The Pond Trail (about 1.5 miles) and the Wilderness Trail (2.8 miles). 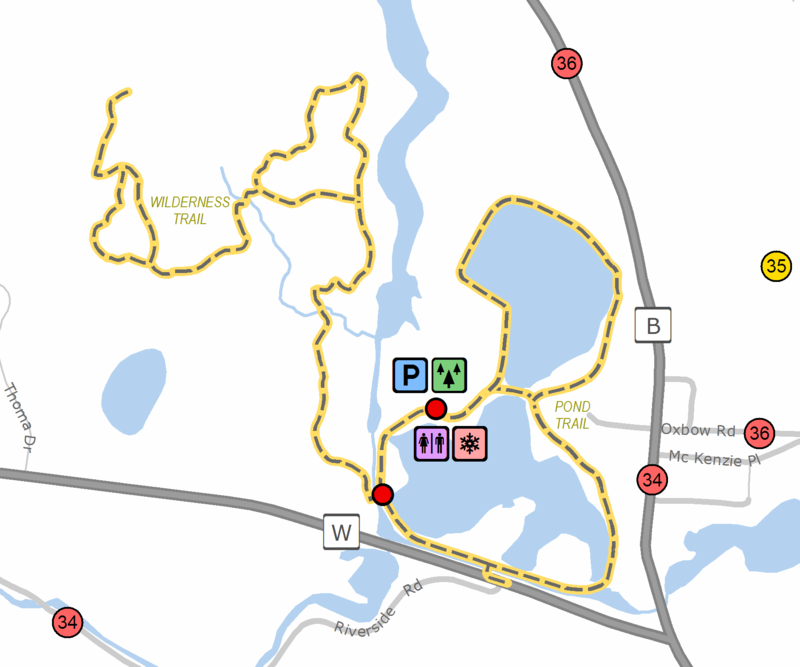 The Pond Trail, which is an aggregate surface, loops around a set of historic ‘hot ponds’ from the logging boom and which recently served as the State’s premier walleye rearing ponds. The Pond Trail, which also offers benches and fitness equipment stations as well as disabled access, is also home to the Wilderness Veterans Memorial along the southern pond. The newly developed Wilderness Trail is a more natural trail experience featuring boardwalks through natural low areas and diverse scenery. The Wilderness Trail segment is not open for biking and there are no benches nor disabled accessibility.